Well, the unblockable argument is pretty valid. Most characters have 1-2 unblockables, Yoshi has what... 18? 19? @Tenshi, i see, but how long did it take you to become as powerful as you are now? What a funny coincidence Junon. I recently found that move by accident and have been practicing with it. I never used to really use unblockables but I have started to use them quite a lot. Someone played me recently and thought it was someone else on my account, so I must seem quite different because of this. Well, this, and a few hints Tenshi has given me. They must look and think, 'nah, Jembru can't use those moves, this must be her friend using her account'. There is still a very long road ahead of me if I want to catch up with the rest of the tekken community, but if you look behind you, that little dot on the horizon, bobbing back and forth and getting slightly larger as time passes, is me!!! # YoshiDivine : @Tenshi, i see, but how long did it take you to become as powerful as you are now? Well, it's been a long time since I started playing. I can say that i play at competitive level for about 6 years (and started playing more than 10 years ago). 1. At first, it was learning all Yoshi's moves and how they flow together, which move is best used after which, okizeme, custom strings, setups (Tekken Tag, Tekken 4 times). In Tekken 6, the true idea of how to play appeared in my head when I started playing other characters. I noticed differences in the way of thinking and building strategy between Yoshi and my subchars (Jin, Lili, Dragunov, Feng, Alisa). Yoshi has to know his opponents in and out. My playstyle is truly all about adapting with only a few universal strategies. The more experience you have, the stronger you are... so it's a never ending process I suppose. @Tenshi, what could be linked with uf + 2 on counter? strange, i realise that, on counter: uf + 2, df+1, 1, b+2 ~ 1.
but: uf + 2, d+1, 1, b+2 ~ 1 is not possible, d+1 keeps u in a WS position while df+1 throws u out of it, i discovered this by accident. anyone else had notice this? Of course we knew it. FC low punch leaves you in crouch recovery, but even though it does so, you can still do a crouch cancel. (~u). But d/f+1 is stronger, so why low punch? Anyways... you don't make a 'bound' in your juggle. Why is that? If you don't make bound, you should be doing d/f+1, 1, b+2,1~1+2(KIN),f+2. Some stronger juggles are also possible. am ashamed... i had to spam d/b + 3 in order to beat the steve fox, the kid was a monster... i had no choice. i just kept my distance and make my manji boots make love to his shin. What's you attitude to playing Tekken and Yoshi, really? Are you ready to sit down and learn hard for a few hours a day? If you want a fast progress, it's inevitable. In addition, Yoshi should never leave your thoughts. ... sounds scary? 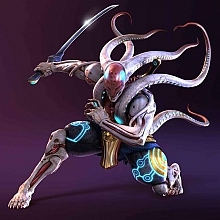 It's the Yoshimitsu Obsession Team, babe Don't you forget it! Well, there was even an experiment involving both training physically, and visualising the activity. There were three groups of people who were told to practice throwing a basket ball into a basket. 3rd. group - half of the time they were visualising, and the other half they were practicing. Guess which group had the best success ratio? ... the third group. They were the best in throwing the ball into the basket. Want to be good in Tekken? Not only play it, also think a lot about it. I have heard about racing drivers has been using a technique a like when they couldn't test out the track them selfs because of distance issues, some actually played video games to gain knowledge of the track because of that they were able to visualise the track and tackle the corners right. and yes, that steve fox was a masher, meaning he rarely block, but the funny thick is, he seems to know how to back up his moves. if u block any move for him, and you try to attack right after, he'll either do that dodge move where he leans back or he does a quick move or something, so it seems as though he's flawless. poking him with d/f+4 help slow him down a bit though. Hey, I got a question. How do you beat nina ??? I was playing against this PRO nina, and yeah I believe he was a pro cause I couldn't add him his list was full, and others said he was pro. But anyway I was only able to beat this dude with luck, random shoulder attack (I use paul) and random scissor kick. - spam d/f+2 more, it's the best move Paul has. High-crushes punches and has great reach. - use d/f+1 into sway back and hunt for Sway~3,2 (on CH you have a juggle, yeah?). d/f+1~b, d/f+1~b... dance, dance. - can you f,f+2~cancel? Learn to use this, the justframe version, the non-justframe version and the cancel to mess up. It's one of Paul's main offensive tools. Also, know the limitations of each version. - ... the rest is probably too much into details and reactions.